Join us this half term for a selection of award-winning animated shorts chosen by the British Animation Awards for children and their families. Programme 1 has been specially selected for 4-7 year olds, while Programme 2 (Wed 20 - Sun 24 Feb) is aimed at 8-12 year olds and features a dazzling variety of animation techniques, exploring stories and themes full of creativity and humour. This is Programme 1: eight award-wining shorts - a more cheerful collection of stories from around Europe you will not find, full of music, colour and character (and no dialogue!). From rising to setting, the sun is always cheerful except when everyone hides in the shade. How ungrateful! How can one tiny bird find its voice amid the sounds and rhythms of the busy town? Chop! Cut! Slice! Grate! A kaleidoscope of crazy fruit and veg to have you dancing in your seat; in French, the words ‘fou’ and ‘dingue’ mean ‘crazy’! In a world crafted of wool, the postboy and his cat fly through the clouds and stars to deliver their parcels. 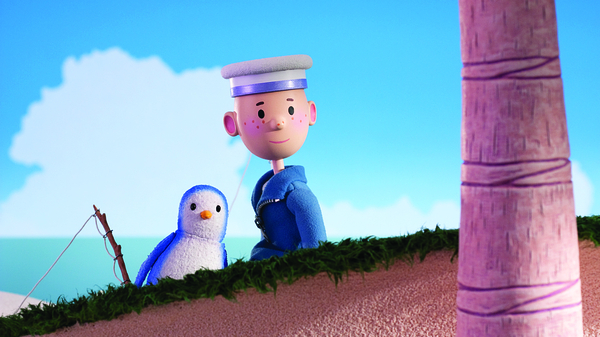 With one little rip of his cardboard box, Dodu’s imagination lets in the sea and sweeps him away to adventure. In spring and summer the tree’s leaves keep the barber busy. What will they do in autumn and winter? Across a crowded animal mobile, a lonely cow notices a smiley mouse. Join us this half term for a selection of award-winning animated shorts chosen by the British Animation Awards for children and their families. Programme 2 is aimed at 8-12 year olds.